Aaaah, what it is to pick up a book by Nicholas. Even knowing you’re going to go on a hell-ride (no pun intended…) with him, you pick it up and read it, because it’s going to be that good. And Hell Divers is no less. Oh no. Within a sentence or two Smith had sucked me right in to X’s world and life on board the Hive – one of the last two airships floating above a devastated Earth. And what a fascinating scenario. Humanity survives solely in huge airships that fly around above a totally devastated, radioactive Earth. These airships are far from airworthy, and are pretty much staying up there by their bootstraps. To keep these massive colonies in the skies, Hell Divers must parachute to the surface of the devastated Earth for supplies, then ride back up to their airships on helium balloons. As the book opens, we meet X, by far the most experienced Hell Diver on his ship with a total of 95 jumps to his name. It’s clearly pointed out that the average most divers make is 15 jumps. This man surely knows his stuff. 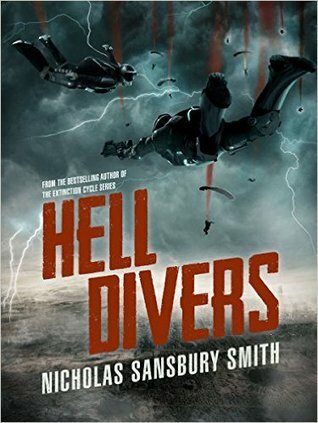 And the motto of the Hell Divers is one of the coolest I’ve come across: “We dive so humanity survives.” That’s their whole existence right there, in a nutshell. That was the thing about extinction: every move became a life-or-death decision, with the fate of entire species on the line. That particularly caught my eye, having recently seen a documentary on the extinction of the northern white rhinoceros, and how that was precisely the issue – every move made becomes a critical decision. This book has one of the most beautiful covers I’ve seen in a good long while. Very relevant to the story, and puts one quite in the scene for what happens in the book. Great fusion there. Without a doubt, Smith is becoming a master storyteller. I guess that begins to happen when one has more than ten novels under one’s belt. Each successive book of his that I read is a step up from the previous one, and his ideas are no less inventive. 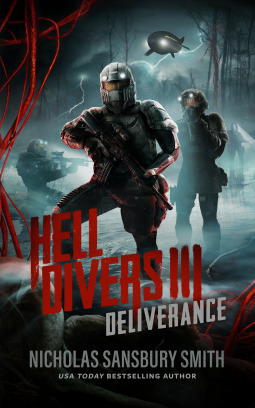 I look forward to picking up the next Hell Divers novel. Please get writing!